As part of the community-wide cleanup effort from 9 to 11 a.m., Saturday, April 19, the Sewanee Civic Association has selected the big rock on the right of Highway 41-A on the way to Cowan as its area. SCA members will clean up the trash around the small parking lot and along some of the roadway. Garbage bags will be available for participants at the Angel Park and in front of the University Book and Supply Store on April 19. The Sewanee Civic Association is undertaking the celebration of the 50th anniversary of the desegregation of the Sewanee Public School, now Sewanee Elementary School. Sewanee Public School was the first public school in Franklin County to integrate, which took place in 1964 as a result of a combined effort of eight Sewanee families to bring equality to our school system. The State of Tennessee offers precise guidelines as to text layout and language and all marker content must be approved by the State Historical Commission before production is begun. The goal is to have the historical marker approved, produced, and in place by MLK Day. Further celebrations are planned to honor the 50th anniversary. 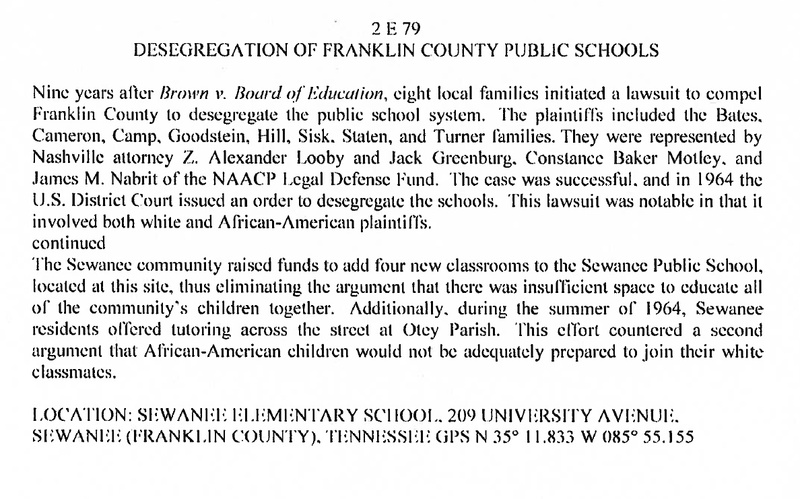 The Tennessee Historic Commission has approved the historical marker commemorating the desegregation of Sewanee Public School, now Sewanee Elementary School. The two-sided marker should be in place at the end of January. The Sewanee Civic Association (SCA) is overseeing the rebuilding/reinventing of playgrounds on the Domain. These are Elliott Park, the Sewanee Community Center, Woodlands, St. Mark’s Center, and the Ball Park. All are in current state of disrepair. The SCA is currently working on improving Elliott Park. This will be a collaborative community effort. The goal of the Sewanee Civic Association is to help improve municipal conditions and equipment, and raise money the town cannot raise in taxes because it is unincorporated. Parks have always been a community led initiative. In fact, the SCA through community funding, built one of the first parks in Sewanee, Shoup Park. In recent years, from the playground at the Sewanee Community Center to the fields and playground at the Ball Park, community members saw a need, secured funding, built the parks and play structures, and maintained them. In 2012, the University removed the pirate ship, the cabin, the automobile, and the picnic table at Elliott Park. Emily Puckette then began discussions with the University about playgrounds. The SCA stepped in, creating a Parks Committee. In one of the first steps to have an adequate park system in Sewanee, the SCA entered into a memorandum of understanding with the University of the South and Friends of the Dog Park for the Phil White Dog Park. The Friends of the Dog Park is a group of volunteers who wanted to have a safe place for dogs to play. A main concern was this group was not duly organized. This park is funded and maintained by the community through the Friends of the Dog Park Committee. The Parks Committee then conducted a community wide survey in September 2013 to gather community input about plans to construct a community park and playground. Approximately 150 community members responded. Of the five proposed sites—Elliott Park, the Sewanee Community Center, Woodlands, the Ball Park, and St. Mark’s Center—two-thirds of those responding named Elliott Park as their first choice to be revitalized. The Parks Committee analyzed the survey data, determined the location and footprint of the proposed park, and then submitted Requests for Information to possible vendors. RFIs were sent to nine playground companies. RFPs (request for proposal) were then sent to four finalists, which, in turn, sent detailed proposals. The Parks Committee rejected those, and has now settled on a fifth company, Game Time. This company is reputable and has built many playgrounds in the region. All parks must be Americans with Disabilities Act (ADA) compliant. Half of the play components need to accommodate disabled children, and walkways and ground surfaces need to be wheelchair accessible. From the survey results, the most frequently suggested equipment for a park was a climbing structure, swings, and a slide. There must be a system in place where there is accountability to maintain the parks. It is imperative that parks in Sewanee be safe and sustainable places to play for years to come. At the April 15, 2015, the active SCA membership present approved the plans for Elliott Park. Construction is expected to begin in September 2015.